As the month of June progresses I will be posting information about Scoliosis, what it is, who is affected, treatment options and more. Most of all during the month of June I will be sharing my story and my life with Scoliosis. 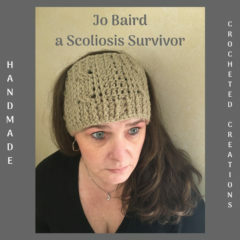 Yes, I have Scoliosis and I am a Survivor! Scoliosis affects 7 million people in the U.S. alone. Of the 7 million people affected 85% of those are young girls and women. 85%! It is unknown why young girls and women are affected more, but if young boys or men have it it is less severe for them. My name is Joey (Jo) Lea Baird and I have Scoliosis. I was diagnosed with Congenital Lumbar Scoliosis when I was 13 years old. Congenital means my Scoliosis is hereditary, that someone else in my family has it. I was taken to see many doctors with a year of my diagnoses. I went to a number of specialists and they all pretty much said the same thing, that with staying active, with special exercises, and staying healthy I would be fine. During my high school years I was able to perform the regular activities in Gym class; I played on an all girls’ Softball teams; I was asked to join Track; basically I stayed active. I seen a Chiropractor for 3 years and would get routine treatments and adjustments. I never had any back aches or pain associated with my Scoliosis until I was 18. When I was 18 I got pregnant and had a son, after that I started having back aches, leg cramps, and muscle spasms. I never had any noticeable signs in my body until I gave birth and my Sacroiliac Joints shifted causing my spinal deformity to show. My right hip shifted out, my left hip twisted in, and my left shoulder started curving forward. The image below shows a pretty good adaptation of what I looked like after the birth of my son, except my Scoliosis curves to the right, not the left. This should be enough information to get you thinking about Scoliosis and who is affected by it. Be sure to stop back by for another addition to My Story and more on Scoliosis. Your website looks great! I don’t know much about website building or investing. I am going slow building mine and using the free ecourses that help with website building. As for my Newsletter, I will be working on that this week, thank you for asking. Stop back by in a week or two to stay informed.